Maintaining mobility and dexterity is important to continuing in an active, healthy lifestyle. A variety of conditions and diseases can cause joint and muscle pain or injury. By using diagnostic ultrasound, a non-invasive, non-radiation technique, Rheumatologists at Rockville Internal Medicine Group are able to diagnose and treat a variety of musculoskeletal conditions. The ease of use of this tool, as well as other cutting edge resources, allows for ongoing monitoring and re-evaluation when necessary, and that allows for your doctor to make any necessary changes in treatment more easily. Rockville Internal Medicine Group also offers PRP Therapy, or Platelet Rich Plasma Therapy, a non-surgical treatment for joint injuries and arthritis that stimulates the body’s natural healing forces. PRP is a concentration of platelets, which can jump-start healing. To learn more about Dr. Schainker’s work with PRP Therapy, visit our PRP website. PRP, or Platelet Rich Plasma, is a substance made from your own blood to trigger healing. Platelet Rich Plasma Therapy is a relatively simple, non-surgical treatment for joint injuries and arthritis. It merges cutting-edge technology with the body’s natural ability to heal itself. The PRP is a concentration of platelets, which can jump start healing. Platelets contain packets of growth hormones and cytokines that tell the tissues to increase rebuilding of tissues to enhance healing. When PRP is injected into the damaged area, it stimulates a mild inflammatory response, which triggers the healing cascade. This leads to restored blood flow, new cell growth, and tissue regeneration. Because the blood is your own, there is no risk of rejection or acquiring blood borne diseases such as HIV or hepatitis. You will visit with the Doctor or Nurse Practitioner, who will ask about your medical history and give you a brief exam to determine that you are in good health to proceed. The NP will obtain the blood sample and prepare the Platelet Rich Plasma. The doctor will examine the joint which will receive the treatment, clean the area with an antiseptic soap, and apply numbing medicine. Using ultrasonic guidance, the PRP will be gently injected into the joint space and joint support tissues. After your treatment. you will stay for a short 15 to 20 minute observation period and we will review discharge instructions. At check-out. you will schedule a follow-up appointment. The process may be repeated 1 to 2 times over six to sixteen weeks. What can I expect after the PRP treatment? You may have mild to moder­ate discomfort which may last up to 1 week. There may be temporary worsening of symptoms due to a stimulation of the inflam­matory response, which is necessary for healing. Your doctor or NP will instruct you in the use of ice, elevation, reduced activity, and analgesic medications for comfort while the PRP is initiating healing. Also physical therapy or a therapeutic exercise program will be prescribed. What should I do when I get home following the procedure? Because Platelet Rich Plasma releases growth factors, it is important to not disturb the area of injection for at least 48 hours. We ask that you refrain from activities other than necessary walking or driving in order to receive the maximum benefit of the PRP growth factor stimulation. It is helpful if you can be sedentary for 48 hours, and refrain from any vigorous activity for up to 2 weeks following each procedure. What Medications Can I Take? Please do not take any anti-inflammatory medications such as Ibuprofen, Aleve, Motrin or high dose Aspirin. You may take Tylenol or homeopathic pain relieving medication if necessary, or you may be prescribed an appropriate analgesic. If you are on an 81-mg. daily dose of aspirin for cardiovascular reasons, please do not take it within the first 48 hours. Your doctor or Nurse Practitioner will discuss your other medications and instructions prior to the procedure, and will review instructions again after the procedure is completed. Millions of people develop osteoarthritis as they age. This process results in joint pain, swelling, instability, and loss of function. Current non-surgical treatments for osteoarthritis of weight bearing joints including weight reduction, rest, therapeutic exercise programs taught by physical therapists, non-steroidal anti-inflammatory drugs such as ibuprofen (Motrin), naproxen (Naprosyn, Aleve). or analgesic medications such as acetaminophen (Tylenol). As the degenerative process advances, patients may be offered steroid (cortisone) joint injections, or Visco-supplement injections such as Synvisc, Hyalgan, or Orthovisc. Bracing and assistive devices such as cane and walker can be helpful. Though these approaches may help in the relief of symptoms, they are pal­liative and do not correct the underlying problem of cartilage degeneration. Healthy cartilage is the ball bearing surface of bone that allows a smooth, gliding, friction free joint. When the effects of the degenerative process cause unremitting pain, inflammation, and dysfunction-the patient is referred to an orthopedic surgeon for consideration of joint replacement with man-made materials. There is no doubt that the advent of joint replacement surgery has been one of the great advances of medicine in our lifetime. However, many patients are not candidates for joint replacement surgery due to medical conditions such as cardiovascular or pulmonary disease. Some younger patients may wish to postpone surgery-as artificial hips and knees can wear out in about 15 years requiring a second joint replacement over time. Fortunately, there is a growing body of scientific evidence indicating that autologous (from one’s own body) mesenchymal stem cells (a primordial regenerative tissue found in everyone) have therapeutic value for the treat­ment of painful osteoarthritis. Stem cells act as the body’s repair kit because they have the ability to become many different types of cells. A recent news article describes the use of stem cells in correcting Type 1 diabetes. Another article describes improved eyesight following stem cell placement in the retina of patients with macular degeneration. For the past 3 years, the Rheumatology Department at Rockville Internal Medicine has been a leader in the medical community utilizing platelet rich plasma in the treatment of arthritis of the knee, hip, and shoulder-as well as for chronic tendinitis of the shoulder and Achilles tendon. However, this approach has been found to be less effective with advancing age and diminished cartilage reserve in the affected joint. Addressing this issue is impressive medical literature describing relatively painless office-based techniques which combine stem cells harvested from the patient’s own bone marrow or abdominal fat-with platelet rich plasma-to attempt a more robust regenerative cartilage repair response than can be obtained from platelet rich plasma alone. It is known that there are 500 times more stem cells in superficial abdominal fat than bone marrow-per unit of volume. These fat derived stem cells are more resistant to aging and more anti-inflammatory than bone marrow stem cells. Fat is more comfortably removed than bone marrow. Therefore, the Regenerative Medicine Center at Rockville Internal Medicine is using fat derived from a modified liposuction technique in the office to obtain stem cells for use in the treatment of arthritis. Fat derived from the patient is safe and avoids ethical issues associated with embryonic stem cells. 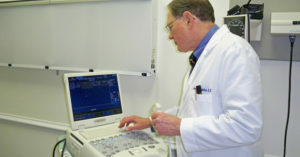 The protocol being utilized at Rockville Internal Medicine is that used by Bio-heart, a biotech firm nationally known for regenerative medicine technol­ogy. The protocol consists of two therapeutic sessions: at the first session adipose derived stem cells and platelet rich plasma will be injected into the joint. Approximately 30 to 40 days later, a “booster” injection of platelet rich plasma will be in injected into the joint. All injections will be performed under ultrasound guidance for accuracy and optimal effectiveness. If you feel you might be a candidate for the above office-based regenera­tive medicine approach for the treatment of disabling arthritis, please call the Regenerative Medicine Center nurse, at 301-762-5020 ext. 3141 for a consultation appointment. We are a Center dedicated to the diagnosis, treatment and comprehensive care of patients with Fibromyalgia and related disorders. Our multi-disciplinary focus utilizes patient education and self-help to enable and empower the patient to better manage and control symptoms. Through these efforts, patients will acquire new skills, make lifestyle changes, and participate directly in therapeutic decision making. Education and self-help are important elements in the design of the Center and are integral to successful outcomes. 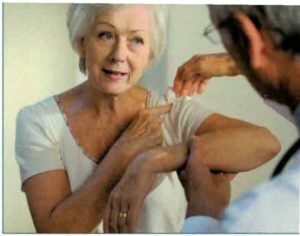 Patients will be provided with handy brochures, pamphlets and teaching materials from mainstream professional organizations such as the National Fibromyalgia Association, Arthritis Foundation and American College of Rheumatology. In addition, patients will be given a list of websites and useful resources that are available on the Internet. Finally, they will be encouraged to join listservs, patient-oriented chat rooms, and various forms of social media to share their experiences and learn lessons from others. In the planning stages is an RIMG-based support group, a forum for sharing best practices and success stories. We intend to assemble a small group of patients with the session being led by an RIMG provider, nurse or staff member who would act in part as leader and “coach”. The addition of a patient whose life has been changed dramatically and who has benefited greatly from the types of services provided by the Center would be highly desirable. Infusion Center: Certain diseases require the administration of intravenous medications for an ongoing period of time. In the past, this was usually done at a local hospital, which caused significant inconvenience to the patient. In order to provide a less stressful experience, RIMG has created a relaxed, friendly environment for patients requiring intravenous infusions at our clinical site. The unit provides comfortable recliners and a TV with DVD capabilities. All infusions are monitored directly by a Certified Nurse Practitioner under the supervision of the ordering physician. NOTE: The above documents available for download are in .pdf format. Click here to download the free Adobe Acrobat Reader.